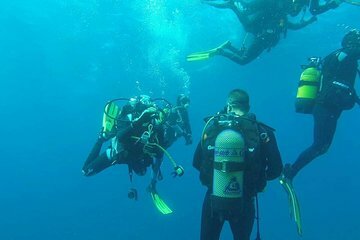 With clear waters and shallow reefs, the Canary Islands are a scuba diving hot spot—and the perfect place in which to master the skills needed to dive safely. On this beginner's dive course, learn the correct theory and practise during an introductory dive, then take to the waves with your instructor. With professional instruction throughout and all equipment included, dive into the world of scuba in safety and collect your diploma. After completion of the theoretical session and the immersion, you will get a certificate. Immersion lasts between 30 and 40 minutes.